*PLEASE READ -- Most decals are covered with a clear “application tape” that allows you to transfer the decal to the application surface. THIS WILL BE REMOVED AFTER THE INSTALLATION. To make sure the decal will stick to the application tape (and not the backing), apply pressure to the entire decal using a squeegee, credit card, plastic spatula or your finger. Some decals will have paper application tape over them or no application tape at all. Surface temperature for installing the decal should be between 60-90 degrees. While the decals are designed to work in extreme temperatures, installation requires the surface to be warm for the adhesive to make a good initial bond. Thoroughly clean the area where the decal is to be applied using a non oil based cleaner; warm soapy water works fine. Allow time to dry. You may wish to use rubbing alcohol on the application surface to make sure that it is cleaned of all chemicals. Trim around the decal if necessary using scissors or an Exacto knife. Make sure to use the decal itself to center or level the decal since the application tape may not be perfectly cut. Be careful not to cut the decal or YOURSELF! Peel the paper backing off. This is done easiest by placing the decal FACE DOWN on a flat surface. Then peel the paper backing off making sure the decal sticks to the application tape that is on the front of the decal. If the decal is sticking to the backing and not the application tape you need to apply pressure in that area until it does. Position the decal where you would like to place it. Be sure to level the DECAL since the application tape may not be level with the decal. DO NOT use any pressure yet. If the decal is not level or centered you may be able to reposition it if you have not applied pressure. Once the decal is where you want it, apply pressure to all of the decal. You may use a squeegee or your fingers. A credit card, plastic spatula or something similar will work in place of a squeegee. Now it is time to remove the application tape. Start at a corner and slowly pull back, PARALLEL to the surface. DO NOT pull away from the surface. Installing Outlines, Contours, etc. are done by applying the larger of the 2 decals first. This will normally be your outline color. Then you can install the top layer next. With small decals you can normally just "eyeball it". With larger decals you may want to install the top layer wet or by using tape (see links below). Shadows are made by first applying the shadow color to the surface FIRST and then applying the main color slightly offset to the shadow color. Slightly above and to the left is the most popular but any variation looks great. If you have a 2 color/layered decal (Outlines, Shadows, Fills, etc.) wet installation can be used for the top layer for proper placement but is not required. For a wet install simply spray down the the installation surface (decal that has already been installed) using a spray bottle filled with water and a VERY small amount of liquid soap. Also spray down the backside of the decal you are installing as you remove the paper backing. Now position the decal where you want it withOUT applying pressure. Once it is aligned use a squeegee or equivalent to remove all the water. 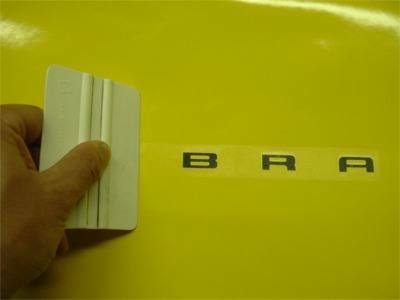 After you have allowed the decal to dry (a heat gun or hair dryer speeds up the process) remove the application tape. This wet method should not be used on metallic films such as reflective material. A heat gun or hair dryer can be use to “stretch” the decal around curved surfaces. Be careful not to overheat the decal as it can burn. This may be used in wet or dry installation. Small bubbles can be squeegee’d to the edge of the decal. For larger bubbles you may use a pin to pop them and then apply pressure. For extra durability clear fingernail polish can be added to the corners of the decal. This is highly recommended for decals that have small points (such as flames) or automotive (outdoor) decals. Be careful when cleaning around the decal. A rag or sponge can grab a corner which can cause the decal to peel. Especially for the first few days as it will take time for the adhesive to cure. We always like to see pictures of your decals installed. Please upload your photos to our Facebook fan page. This can be done directly on the Facebook page. For precision installations with PICTURES make a selection below. Thoroughly clean the surface withOUT chemical cleaners. If the decal was large and came rolled up, lay the decal flat for one day to allow the decal to naturally flatten. Start by installing short end and working your way down the longest direction. You may pull the decal off and reapply if necessary but please do so gently. Squeegee out any air bubbles by starting in the center and working your way out to the edges. If using a squeegee, be sure to cover in fabric (a sock works well) to keep the squeegee from scratching the ink. This is necessary since this type of decal does not have application tape over the top of it. Wipe the decal down with a soft, dry cloth after installation to remove any dust or residue that may have appeared during the application process.